After Mystery Inc. bumble a case and nab an innocent man, theyre forced into early retirement from solving crime. But it doesnt take long before their old friend Vincent Van Ghoul needs help, and pulls the team right back into action. It all started one Summer when Scooby-Doo, Sh... read full description below. After Mystery Inc. bumble a case and nab an innocent man, theyre forced into early retirement from solving crime. But it doesnt take long before their old friend Vincent Van Ghoul needs help, and pulls the team right back into action. It all started one Summer when Scooby-Doo, Shaggy and Daphne secretly hunted down 12 of the worlds spookiest ghosts, but failed to catch the most evil one of all the 13th ghost. 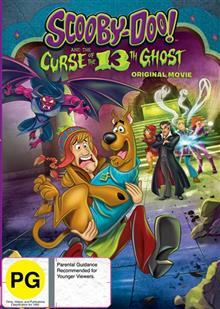 With the 13th ghost on the loose, the gang will have to look past their hidden secrets and settle some unfinished business. Bundle up and get ready for the icy slopes of the Himalayan mountains, chilling car chases, crystal balls and spine-tingling spells in this terrifyingly fun original movie!